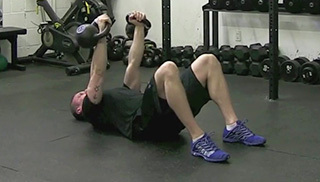 Start on the floor while holding a kettlebell in each hand. keep your shoulders down and away from your ear lobes and hold the kettlebells directly above your shoulders. Pull your elbows towards the floor and keep a 90 degree bend in your arms. Try to touch your elbows to the floor at the same time while maintaining your core bracing. 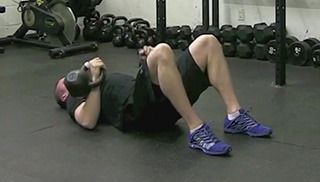 Press the kettlebells back up and try to press yourself away from the kettlebells and into the floor.